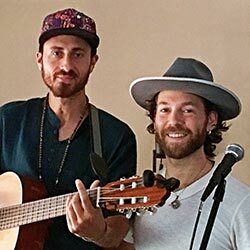 The Sāmi Brothers are a spiritual and musical duo devoted to offering uplifting and inspiring ceremonial music. Madhu Anziani and Alexander Kugler are the sanctioned Medicine Song Carriers for the Pachakuti Mesa Tradition, bridging ancient Peruvian indigenous wisdom with contemporary musical composition. The songs they offer have been inspired by the teachings of don Oscar Miro-Quesada. Their music has been featured in the documentary film, The Roots Awaken, and they have released two studio albums, Ch’aska Punku (Star Portal) and Nuna Kallpa (Soul Power). Listening to these albums you will hear songs in English, Spanish, Hebrew, Tibetan and Quechua (a language indigenous to Peru). Alexander weaves his 15 years as an opera singer and cantorial soloist into his teaching and facilitated community prayer. Alexander also leads people in group singing workshops to help liberate their voices and is passionate about his Men’s Evolutionary Coaching work at ManhoodEmbodied.com. Madhu is a musician, ceremonialist and sound healing artist. Through the journey of recovering from being paralyzed, Madhu discovered sound as a healing modality and regularly shares his gifts in workshops and private sessions. Check out his latest offerings at Patreon.com/MadhuMusic. To hear more and support the Sāmi Brothers click here.